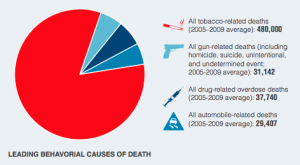 Tobacco kills over 480,000 people each year, more than automobile crashes, gun violence and opiate overdoses combined. The developing teenage brain is particularly vulnerable to the effects of nicotine. 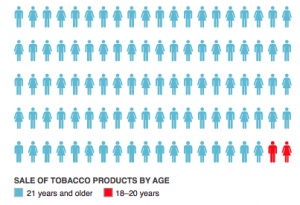 More than 95% of addicted smokers start before age 21. 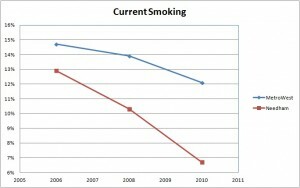 350 youth become regular smokers each day in the U.S. Early exposure to nicotine increases the risk of addiction and puts adolescents at a higher risk for depression, anxiety and substance abuse. Unless there is a trajectory change, tobacco addiction will dramatically shorten the lives of 5.6 million kids alive today. While the smoking rates have declined in the United State, e-cigarette use has exploded since 2014, threatening to undo our progress. 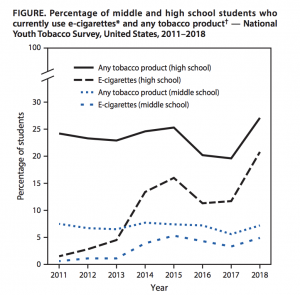 FDA Commissioner Scott Gottlieb has called youth use of e-cigarettes an epidemic and indicated that youth e-cigarette use is up 77% from last year. On average, American kids try cigarettes for the first time at age 13.7. When properly enforced, Tobacco 21 laws disrupt the social availability of cigarettes and other nicotine products to young people. The economic impact of T21 is small. 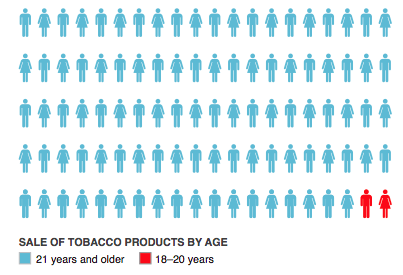 Only 2% of tobacco sales made in the U.S. go to those under 21. 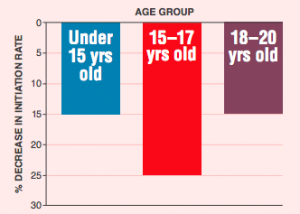 And yet, An Institute of Medicine report predicted that raising the minimum age of sale of tobacco products would result in an over 15% reduction in smoking initiation rates among youth under age 21. 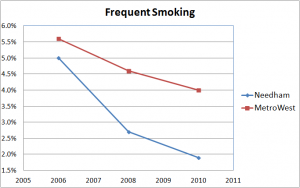 Needham, Massachusetts showed a 48% drop in high school smoking rates after policy implementation, a significant decline relative to comparison communities. In the year after implementation, Chicago found a 36% decrease in 18-20 year olds that reported currently smoking cigarettes. In California, statewide retailer violation rates to under 18 year-olds decreased from 10.3% to 5.7% since implementation of T21.